A PMP 600 in GTA IV. 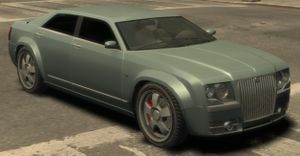 The Schyster PMP 600 is a 4-door car featured in Grand Theft Auto IV. The PMP 600 closely resembles a Chrysler 300C; it is manufactured by Schyster, the GTA equivalent of Chrysler. The intake on the bottom of the front bumper seems inspired by the 2003-present Bentley Continental. All PMP 600s come with car alarms, identifiable by either a horn alarm (the most common), flashing lights, or a beep alarm. According to the Autoeroticar website, the PMP 600 has an absurdly large 600 cubic inch (9.8L) diesel V8 "Semi" engine, hence the "600" in the car's name; "Semi" is a reference to the Chrysler 300C's real-life "Hemi" engine. The car handles through corners reasonably well, but suffers at high speeds due to the length and the soft rear suspension. Acceleration is satisfying, although the top speed is limited due to the heavy weight of the car (145 km/h, 90 mph). A sport edition of the PMP 600 can be occasionally been seen on the streets; it usually sports a very dark black, plum or blue paint job, a sport mesh grill in the front, and a small spoiler attached to the trunk. It is often driven by the Mafia. Six PMP 600s presumably belonging to the Jewish Mob can be found outside the The Libertonian during the mission "Museum Piece"; three are black and three are white. Interestingly, these PMP 600 bears the both PMP grilles at the same time by mistake. If the player user a trainer to remove and add accessories, both of the grill accessories can be removed. This PMP 600 can also be found in the mission "Clocking Off". Requested backup from Dwayne Forge in the form of two North Holland Hustlers members (available when the player's friendship with Dwayne is sufficiently high) may arrive in a uniquely red PMP 600 (besides a Patriot or Presidente of the same color). In one of Brucie's e-mail-based Exotic Exports, Niko has to retrieve a vibrant maroon red PMP 600. A "sports" variant of the PMP 600 in GTA IV (Rear quarter view). A red PMP 600 which the player's backup from Dwayne Forge may arrive in. Two members of the backup and the player are pictured as occupants. The car's "PMP" name may be derived from the term "pimp". The interior of the PMP 600 seems to be ripped from the Schafter, as the steering wheel bears the Benefactor logo, also the logo and dashboard instruments (tachometer, speedometer, odometer and fuel gauge) are less blurred than in Schafter. These features can be seen with using first-person mods. If the player takes a PMP 600 to a Pay 'n' Spray too many times it will turn a unique, dark teal colour. This colour will then be permanent, and no amount of subsequent resprays will change it. This is most likely a glitch, as almost every other car in the game will continually cycle through its available colours each time you visit a Pay N' Spray. The exceptions are the Buffalo from The Ballad of Gay Tony, the Dukes and the Infernus, which all suffer from similar glitches. The two default radio stations in the PMP 600 are Electro-Choc and Radio Broker. Unlike most other cars, the side windows can take several shots from a projectile weapon before breaking, but if the player enters a parked one, he will break the windows very easily with his arm. The PMP 600 is one of the rare cars that comes with a "door ajar" chime, which can be heard when the door is open. The spoiler on the sportier version is similar to the Merit's. The PMP 600 is a very rare car in Broker, Dukes and Bohan, meaning the player will not encounter the car often until Algonquin is unlocked. The PMP 600 is a common and popular car in Algonquin and Alderney. It usually is seen around Francis International Airport and the surrounding area. Spawns more commonly if the player is driving a Cognoscenti. One PMP 600 spawns in the alley by the Exchange District in Algonquin, in front of the New York Stock Exchange replica building, as part of Stevie's Car Thefts. Another will spawn after you do the mission. The modded PMP 600 often driven by the Mafia is commonly found in Westdyke and Leftwood in Alderney, and Little Italy in Algonquin. This page was last modified on 31 August 2013, at 10:18.